Back At The Creekbank : Kathie Hill Music, LLC, Making music with and for kids for over 25 years! A favorite for over 26 years is back for a new generation! 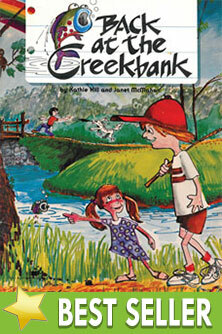 Back at the Creekbank books are digital products and can be downloaded as soon as your payment has processed. All other companion products are physical and shipping charges apply. This popular sequel to Dottie Rambo's "Down By the Creekbank" is simple and simply delightful! On a creekbank fishing trip, Mr. Jenkins shows his young friends the many ways God expresses His love through nature…and how to express our love to Him. First released in 1983 with a script by Kathie Hill and songs co-written by Janet McMahan, this easy to produce musical has been performed on stages, in parks, on truck beds and by creekbanks! Wherever you present this timeless production, your kids will still be singing these catchy songs for years to come. Listen to SONG SAMPLES below & download a FREE Coloring Sheet! Kathie's Note: What kid doesn’t love to explore the outdoors? And with fun songs like "Riddle Me, Riddle Me" and "I Wish I Was a Fish" you’ll catch kids off guard with the message of God’s love and leave your audience grinning from ear to ear! Jewel cased CD with left channel instrumentation and right channel (split) choral vocals (does not contain dialogue or solos) . Downloadable original book with activities and songs only in leadline with lyrics with permission to make 3 copies . Additional copies require purchase of additional 3x license/s. Downloadable original book with songs, script, production notes & piano transcriptions with permission to make 3 copies . Additional copies require purchase of additional 3x license/s.